By 2006 a steering group had been established to look at a format for regular meetings between the representatives. 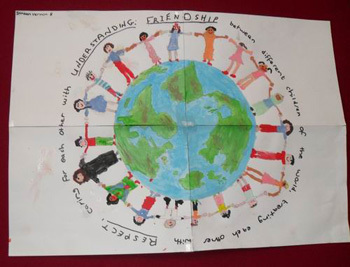 This led to the birth of Northampton Interfaith Forum in 2008 – often known as NIFF. It was agreed that there were seven faiths with sufficient numbers in Northampton to merit representation on the forum, but that members of any faith, or of none, would be welcome to receive all information about NIFF activities and to take part in them provided their purpose was not in contravention of NIFF’s “guidelines for good practice”. At first each faith was asked to provide two representatives. Subsequently this was changed to four. The way in which representation is achieved is left to the particular faith to determine. Over its brief history NIFF has been well served by enthusiastic members and officers, as well as development workers. We think it is fair to say that our role in the life of Northampton is increasingly recognised as central to continuing and improving good relationships between the many communities who share the life of the town – and through the maintenance of our County Directory of faith contacts we offer a service to the whole of Northamptonshire. “We” are members and representatives of the seven main faith traditions in Northampton committed to the words in our Logo which encapsulate our aim: Respect, Understanding, Friendship.